I’m running like my life depends on it. I’m not running fast, like I’m running away from something, but controlled, like I’m running toward something that’s far away. My pace slows as I run up and then…OVER the Queensboro Bridge, leaving Queens, where I was born, and entering Manhattan, where I now reside. I allow myself a quick and barely audible YESSS!–three boroughs down, two to go–and then it’s back to work. At the foot of the bridge I’m greeted by throngs of spectators who make me feel like they showed up just to cheer me on. I turn onto 1st Avenue and head uptown towards the Bronx. “Bobby! You can do it!! !” someone yells from the crowd, a family member, maybe a friend, or perhaps just someone who’s reading the brightly colored duct tape that spells my name on my shirt. I smile and wave in the direction of the voice. But there’s no time to scan the crowd to find the speaker–I still have another ten miles to go. I think to myself, I’m really doing this. I played that scene in my head dozens of times in the summer of 2012, like a high school mixtape in the days before iPods. It was part of my mental training to go along with the grueling physical training I endured as I prepped for the 2012 New York City Marathon. Only that marathon never took place. Just two days before the marathon was scheduled to take place, Bloomberg released another statement, that “a shadow would be cast over the event,” and that it would be canceled after all. Contrary to the oft-quoted maxim, sometimes you can fight City Hall. Meanwhile in Virginia, my fiancée’s family sprung into action just moments after the announcement, looking for a Plan B for us. 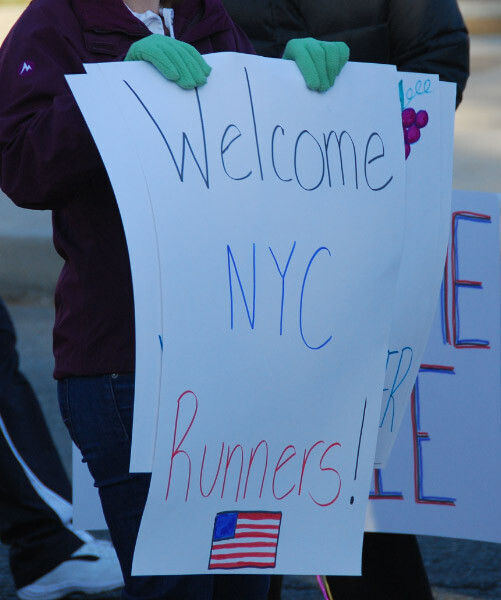 They contacted us shortly after the news of the cancellation to tell us that, if we were interested, a marathon down in Richmond, Virginia, was accepting late entries from New York City Marathoners who still wanted to run. After a few minutes of deliberation, we looked at each other as if to say, “Let’s do it,” and pulled out our credit cards. As poker players say, we were pot committed–we’d already invested so much in the hand that even if it’s a bad decision to keep playing, it would be a worse decision to fold now. 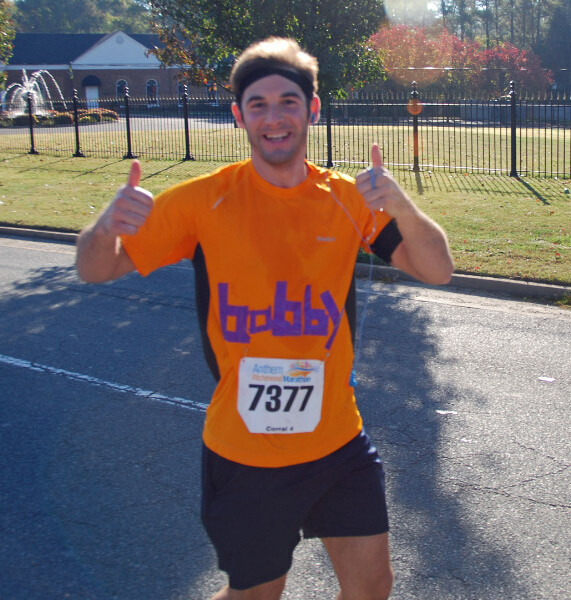 Six days after I was slated to run 26.2 miles around the five boroughs of New York, and twelve days after Hurricane Sandy had come and gone, I was lined up in the streets of Richmond, Virginia–“RVA” to the locals–to finish what I started. I told ya, it’s America’s Friendliest Marathon! As the crowd of runners started to moved forward over the start line and onto the course, I took a quick inventory of my body’s trouble areas–my sometimes stiff right IT band felt good; my creaky left ankle and Achilles was pain-free. But I didn’t account for one body part, my eyes, and the fact that I might start crying. I’m not much of a crier, and at first I wasn’t sure what had prompted that visceral response. I wanted to believe some of those tears were about for the circumstances–namely Hurricane Sandy and its victims–which rerouted my marathon plans from New York to Virginia. But they also felt like tears of joy, for having finally reached my goal of running (or at least starting) a marathon. Wiping my tears surreptitiously, as if I was wiping a bead of sweat in 40-degree weather, I glanced over to my fiancée, who met my glance. We’re really doing it. I was so lost in my own thoughts that when we reached Mile 2, I turned to her and said, “We’ve gone two miles already?” She nodded. I looked at the time: we’d been running for 21 minutes. I’d been coasting, which made my first two miles feel like just a few minutes. I gather this is how the world’s top runners feel all the time, though for them, it actually does only take a few minutes per mile. How do all these people know my name??? The first six miles were almost easy; even by the halfway point, my only concern was taking a bathroom break, which I took just after the Mile 13 marker at a porto-potty with a short line. Relieved–in all senses of the word–I felt renewed and my energy carried me to Mile 16 where I thought, dangerously, This isn’t bad at all. I feel great! But as I read through my options a second time, I realized that I’d have to pay another entry fee if I wanted to run the race in 2013, 2014 or 2015, with my original payment going towards “guaranteed entry.” My spot was, in essence, being held hostage unless I was willing to pay twice (that’s $237 x 2) for one marathon. I had originally qualified for the marathon by completing a series of nine races through NYRR in 2011 (at about $20 apiece, plus the $35 annual NYRR membership). The “9+1” program is actually really nice, especially if you live relatively close to Central Park (where most of the races take place on Saturday and Sunday mornings) but it’s a time and money commitment I’m just not willing to do again. I could also try to qualify by entering NYRR’s lottery program, but as its name suggests, it’s a longshot. I realized then that, in all likelihood, I’ll never run the New York City Marathon. And that kind of bummed me out. It would have been an amazing feeling to come off the Queensboro Bridge, cheered by thousands of people, just as I’d fantasized about. But there are other marathons out there, and I could even see myself running Richmond again someday. I was so disappointed I couldn’t be there to see you cross the finish line of your possibly only marathon 😦 a shout-out to your future in-laws for sending me real-time pix of the momentous event. Well written and well run. 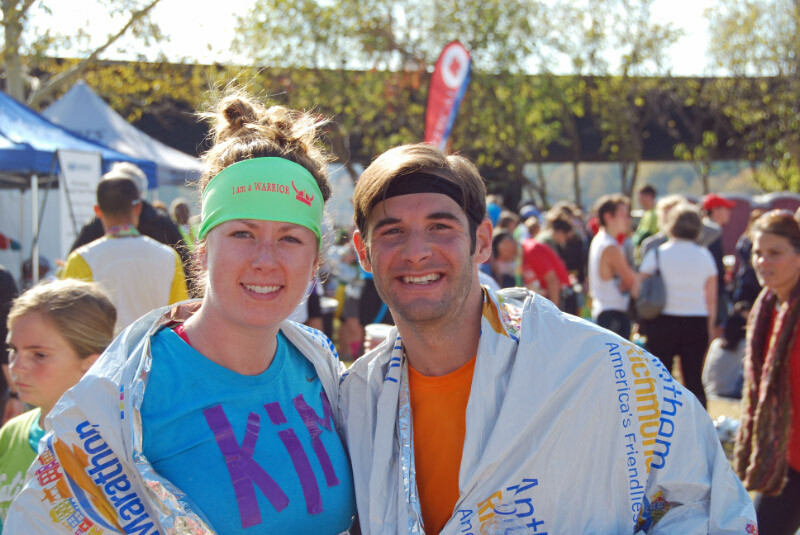 It seems like you utilized the training & running of your first marathon to learn some life lessons…well done! web site in Safari, it looks fine however, if opening in I. Thanks for the heads up (and the kinds words). It appears to be working OK in IE for me now, but I’ll keep an eye on it! It’s actually a cool and helpful piece of info. I am happy that you just shared this helpful information with us. Please keep us up to date like this. Thank you for sharing.